It is imperative that young athletes are protected and that events including distances, weights and safety aspects are considered. As such, UK Athletics have created Rule 107, which advises clubs, schools and competition providers with clear guidelines on the rules that must be adhered to when providing track and field athletics. Click on the table above to view it enlarged, or download it as a pdf. 2. 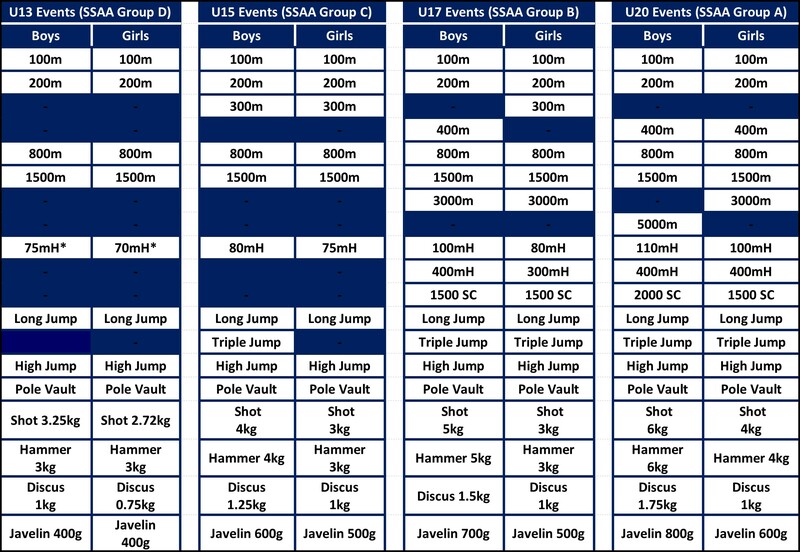 SSAA Track & Field Championships – Group D Boys is 80mH instead of 75mH for UKA U13 competitions and 75mH instead of 70mH for Group D Girls. 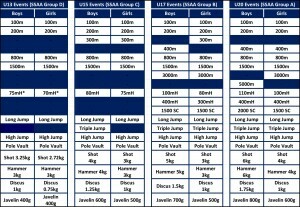 NOTE: UK Athletics Rules do not specifically provide competition guidelines for athletes under the age of 11 years. This does not preclude provision by organisers of competitions for events for athletes younger than 11 years, with correspondingly reduced distances to be run and lighter implements to be used. If athletes in this age group are competing in a combined event they are not allowed to compete in any other event on the same day. Athletes in this age group may compete in track races not exceeding 1 mile subject to the restrictions in the next point below. mile inclusive on the same day. No Under 13 athlete is allowed to compete in any steeplechase event. No athlete in this age group is allowed to compete in Triple Jump events. Other than when competing in a combined event Under 15s may compete in maximum of 4 events on one day of an athletics meeting, and if so doing, one of these must be a relay. If Under 15s are competing in a combined event they are not allowed to compete in any other event on the same day. No athlete in this age group is allowed to run in any race in excess of 3000 metres. No Under 15 athlete is allowed to run in any steeplechase event. 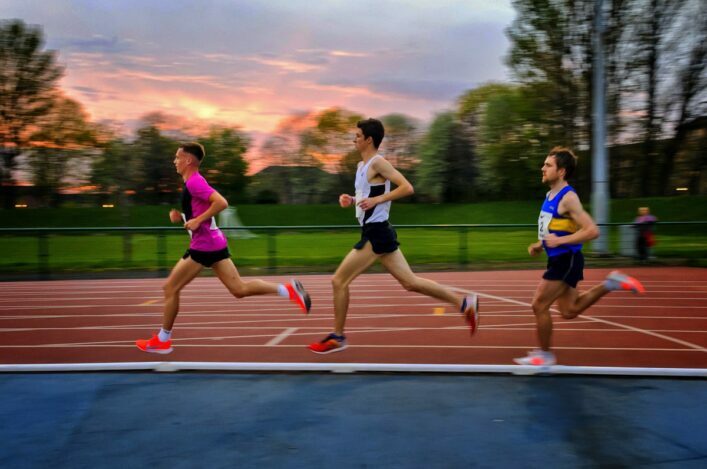 No athlete in this age group is allowed to run in more than one different event between 600 metres and 3000 metres inclusive on the same day. Other than when competing in a combined event, Under 17s may compete in maximum of four events on one day of an athletics meeting, and if so doing, one of these must be a relay. If Under 17s are competing in a combined event they are not allowed to compete in any other event on the same day.